The Beatles definitely had a distinct sound, and while it would be foolish to try and narrow that distinct sound down to one explanation, there is one explanation worth considering as part of the larger picture: the frequency with which The Beatles used the minor 4 (iv) chord in their compositions. This is really more of a John and Paul thing. George Harrison barely used the chord in his songs, and when he did, it wasn't in the "typical" way -- but that's getting ahead of ourselves just a bit. The minor 4 chord is a surprise chord, like reaching for a glass of Sprite and finding out at the last minute that someone actually filled it with Crystal Pepsi. That was a terrible metaphor that only a fraction of the audience will get, so let me try again: it's sweet when you were expecting sour, or sour when you were expecting sweet. Rock music is built on three foundational chords: the I, the IV, and V, which are all major chords. It's the A-D-E combination, or G-C-D, or E-A-B. 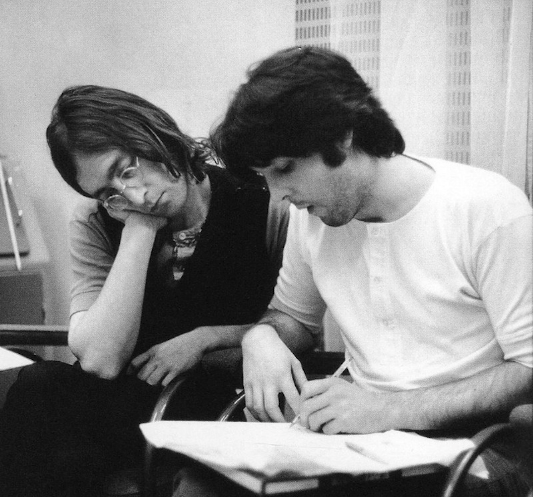 When Paul McCartney tells the story of having to ride a bus across Liverpool to learn B7, he says that they already knew E and A, so B was the "missing chord." He's talking precisely about this foundation of I-IV-V progressions. But again, the big point here is that all three of these chords are major chords, and over and over again The Beatles swapped out the major 4 for a minor 4 which is just so ... so ... well, try it sometime. Instead of playing G major to D major to C major, try G major to D major to C minor. Aha! There it is! That's that "Beatle chord." Let's take a look at some specific examples of how The Beatles used this chord. If the IV and V chord are the major-chord bedrocks of rock compositions, the vi and the ii are the minor-chord equivalents. In the key of G, we're talking about the E minor (the vi chord) and the A minor (the ii chord). It's tough to write a song without using these chords. Using the minor 4 chord after a minor 6 chord is a real hey-gotcha move, because the minor 6 chord just begs to move to the major 4 chord. Think of the old four-handed piano standard, "Heart and Soul": C to Am to F to G, I to vi to IV to V. It's every doo-wop song ever written, right? It's "Please Mr Postman", if you want a Beatles example. In this case, the I chord kicks off the start of the next stanza, so the iv-I resolution must wait until the next phrase begins. In this next set of examples, John and Paul's use of the minor 4 chord follows the minor 2 chord. In the key of A major, this would be the B minor followed by the D minor. What makes this progression so satisfying to the ear is the chromatically descending line that takes place within the chords. Structrually speaking, this ii-iv-I progression is nearly identitical to a simple IV-iv-I progression -- in A major, this would translate to moving from D major to D minor, then back to A, which is precisely the progression both John and Paul use in "In My Life" and "You Won't See Me," respectively. Paul also uses IV-iv-I in "Blackbird" and "Mother Nature's Son," so apparently he liked that chromatic movement. The Beatles certainly didn't invent the minor 4 chord or its usage. "Devil in Her Heart" and "Till There Was You" are two examples of cover songs The Beatles played which use the minor 4 chord, and perhaps those songs helped inspire The Beatles to use those chords in their own songs. What The Beatles did do, however, was to make liberal use of the minor 4, and in songs that were internationally known. The Beatles and the minor 4 go hand-in-hand. That's why it's "The Beatle chord."